Buying an off the plan apartment as an investment property means you don’t have many hassles by way of repairs and maintenance during the first few years. This is great news financially. But there may be even more ways you could be saving money on your investment. In particular, there are a number of items and assets within your investment property that you can claim depreciation against when it comes to your tax return. 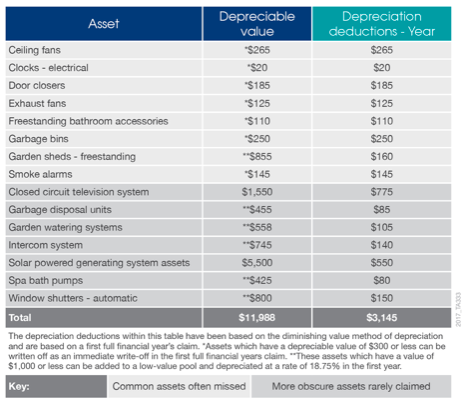 The below table from our friends at BMT Tax Depreciation highlights the many assets within an apartment that they have identified as opportunities to save even more come tax time. The next time you speak to your tax advisor about your property investment, arm yourself with this table and you could claim more than you think. *Under proposed changes outlined in draft legislation (section 2 of Treasury Laws Amendment Bill 2017), investors who exchange contracts on a second hand residential property after 7:30pm on 9th May 2017 will no longer be able to claim depreciation on plant and equipment assets. Investors who purchased prior to this date and those who purchase a brand new property will still be able to claim depreciation as they were previously. BMT Tax Depreciation will be making an official submission outlining our concerns along with suggestions of alternative methods to better resolve the Government’s integrity issue. To learn more visit www.bmtqs.com.au/budget-2017.